Maddy Spier’s been in love with the boy next door forever. As his figure skating partner, she spends time in his arms every day. But she’s also seen his arms around other girls―lots of other girls. How can she make him realize that they can be partners off the ice as well? Gabe’s relationship with Maddy is vital. He can’t imagine skating with anyone else, and together they have a real chance at greatness–maybe even making it to the Olympics someday. So he’s decided to think of her as a sister. After all, family is forever, and he’s never dated anyone for more than two weeks. Then their coach assigns a new romantic skating program, and everything changes. Will this be the big break that Maddy’s been hoping for or the big breakup that Gabe has always feared? 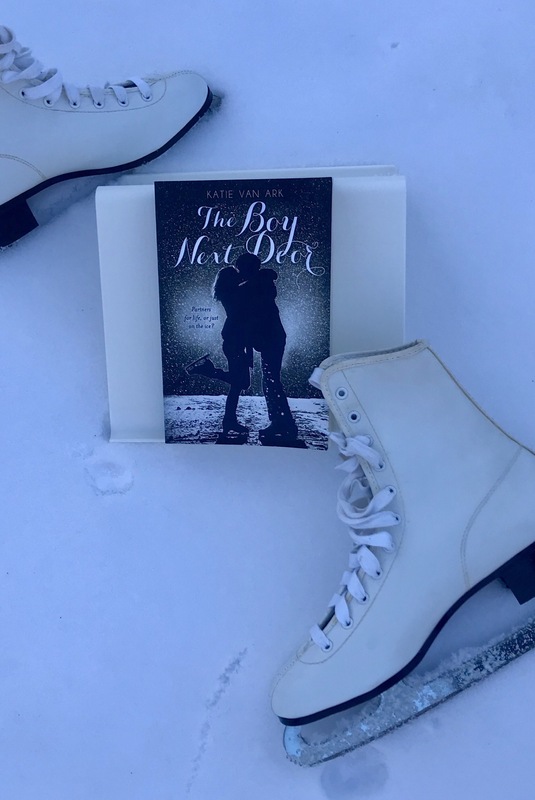 Chosen by readers like you for Macmillan’s young adult imprint Swoon Reads, debut author Katie Van Ark’s novel The Boy Next Door is full of competition, misunderstandings, and of course, plenty of romance. Okay, so, I’ve had this book since May, and just finally got around to reading it. I’ve been desperate to read it for months now, and I don’t really know what stopped me. I knew I was going to absolutely love it, and I did! A few chapters in, I actually had to put the book down for a second because it was just so cute that I couldn’t handle it. It was that adorable. It was also the first book I can recall reading that revolves around figure skating, which was really awesome! I loved how the story centered on a great mix of Maddy and Gabe both on and off the ice. The dual POV of this story worked perfectly. It was great to get to see inside both Maddy and Gabe’s minds, especially Gabe’s. Without being able to read Gabe’s point of view, he wouldn’t have come across as such a multi-faceted character. Being able to see both of their inner turmoils over their evolving relationship with each other was super frustrating, but super awesome at the same time! It was frustrating because I wanted them to be together so badly, but awesome because I got to know both their experiences with each other and information about their lives when they weren’t together that I otherwise wouldn’t have been privy to. The ‘Romeo and Juliet’ theme throughout the book that is referenced often in addition to it being the book that is read in Maddy and Gabe’s English class at one point and is the name of the program they’re skating is great. I remember reading that book my freshman year of high school in English class, so I appreciated the throwback! Maddy’s growing suspicions about her politician father for example, were both realistic and believable, and I really enjoyed how that storyline eventually becomes intertwined with the Nielsen’s as well. It was something that I hadn’t seen coming, but still felt wonderfully executed and flushed out. I thought it was great how Maddy and Gabe’s families were very close, and that we got to see them interact off the ice not only at school, but at their game nights every Saturday night. I loved (I’m using that word a lot in this review….can you tell I fell head over skates for this book? Okay, I’ll stop.) all of the scenes where they’re ice skating. Love love LOVED them. Whenever they would go to a competition I would get sOo stressed out and nervous for them. To transition from my earlier parentheses, small detail, but I loved the lines talking about falling head over skates, or just inserting ‘skates’ instead of feet or whatever else is usually used in that specific expression. It still got the point across as the normal saying, but added a sweet connection to the story’s plot line that didn’t go unnoticed. Connect with the author! You can follow Katie on Instagram at @katievanark and on twitter at @kvanark !